As we move through our busy day, we are constantly bombarded with information through all of our senses. The routine sights and sounds become predictable and tedious. Our brain loves new, novel things. Why? Check out this article for great information/research. Did you know that every movement we make requires an intricate dance between our brain and muscles? Exercise shapes our bones, lungs, and muscles but it also helps to develop our brains. In fact, movement develops structures within our brain such as the cerebellum, corpus callosum, and basal ganglia. Keeping our children active helps to bring oxygen which is required for optimal brain function. So, regularly adding short movement breaks into the school day energizes children and helps to get the ‘wiggles’ out! This helps children to focus before learning new material or before a test. In fact, physical activity helps the brain to become engaged and ready to learn! That’s exciting. Use once every 30-60 minutes of focused learning. Must be done throughout the day and last for 5-10 minutes. I suggest that therapists, teachers, and adults complete the activities along with their students. This encourages kids who are reluctant to participate. Additionally, the activities can be completed by ALL students and are easily adapted for those with limited mobility. Movement clubs, YOGA groups, and Wii dance groups are great ideas for older children and teens. The most important thing is to involve the students in planning groups. Check out my new Activity Cards for Classroom, Clinic, Homeschool. 1) Bumblebee breath. Inhale slowly through your nose. Exhale through your mouth while making a BUZZZZZZZ sound. Try making different sounds as you breathe out. This is FUN and engaging for children and adults alike. 2) It’s easy to massage specific ‘pressure’ points on your body that can lower stress. Try this: gently massage the ‘trigger point’ between your thumb and pointer finger for 30 seconds – 1 minute. Switch hands. There’s also a pressure point on the middle of your eyebrow. Gently massage for instant relief of tension. One of my favorite books is the Brain Gym. There are 26 different exercises designed to stimulate brain function. I love them for ‘waking up’ the brain. Each card comes with instructions! 3) Mandatory breaths. Make it a habit to take 5 deep and slow breaths in and out prior to ANY test, study session, at red lights, etc. Fit it into your schedule to ensure you don’t forget. Remember that our brains thrive on oxygen! 4) Use your CHAIR. Stand holding on to the chair for balance and kick each leg out to the side about 45 degrees. 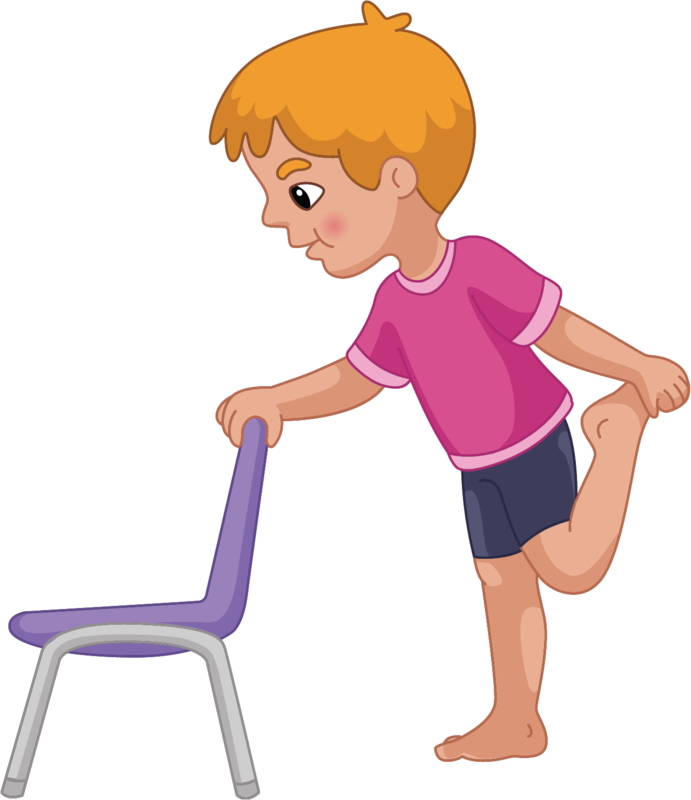 Now try to bend your knee and hold to stretch with your hand while holding on to the chair for balance (pictured on left) to make an acute angle between the bum and your foot. This is a great way to add angles or incorporate math/geometry into movement. 5) Beach balls are light and their size makes them easy to catch. Don’t blow them up all of the way so that children can grasp on to the ball’s material if they aren’t good at catching. As each student catches the ball, they might spell a word, give the answer to a math fact, answer a Science question, etc. 7) Textbook Aerobics. There’s one thing every classroom, homeschool, and clinic has….it’s a BOOK of some kind. Play ‘follow the leader’ and ask a student to come up with an exercise, such as biceps curls using their books. 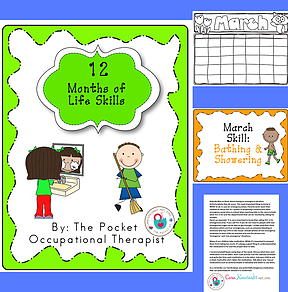 Life Skills CALENDAR, Tips, & Tricks for 2019!! Please let me know which activities you try and any other great ones you do in your clinic or classroom. I LOVE feedback from my readers. *As always, affiliate links are provided for products I feel will benefit my readers. For more information, please read my disclosure policy here.